This is my second bedroom as of September 2013, enjoy! This is my living room as of September 2013, enjoy! As much as I love IKEA, I haven’t been to an actual IKEA store in over a year. The closest one to Indianapolis is in Cincinnati which is not close by. It is definitely a day trip plus you have to have the right vehicle to be able to bring home furniture. But despite the fact that I haven’t been in a while doesn’t mean that I don’t online window shop at IKEA all the time. I’ve previously listed out all of the things in my home from IKEA (it’s actually still accurate even though it was written last August), so this is a list of the things I love from IKEA that I would buy if I had more money and space (and a big enough vehicle to bring it all back from Cincinnati). Originally this was just going to be one post but I found that I liked way too much stuff so it became a two parter! I have a great front porch and nicely sized back yard but I have yet to invest in any patio furniture. 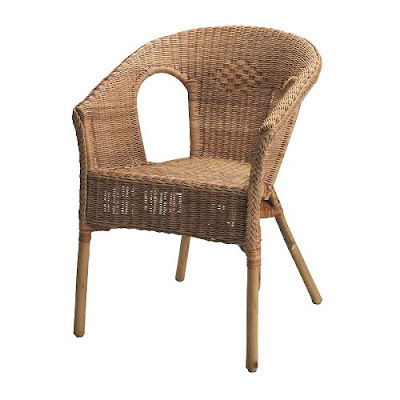 I like this classic wicker deck chair. 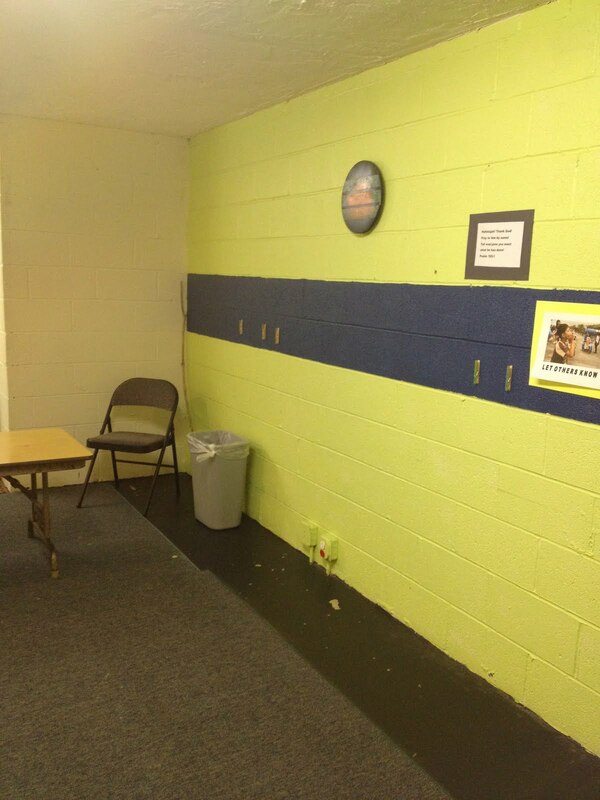 Perhaps four of these chairs around a brightly colored round table would look nice? Available here for $34.99 each. I am one of those people who go through dish towels like candy. I use a new one like every day, mostly because I do not like soggy towels. For this reason, I am always on the look out for a cool new dish towel. Available here for $2.99. I only have curtains in my dining room but lately I’ve been considering them for my entry way window and even in my living room. I’m still on the fence but these subtle grey linen ones are lovely. The pair is available here for $49.99. Is this rug too crazy? I kind of love how crazy it is. I also love how super Swedish it is. Available here for $49.99. I’m not an artist but if I were I would want this rolling filing cabinet. I guess you wouldn’t have to be an artist to use it but I can just imagine using it for large pencil drawings or something equally cool. Available here for $119.00. 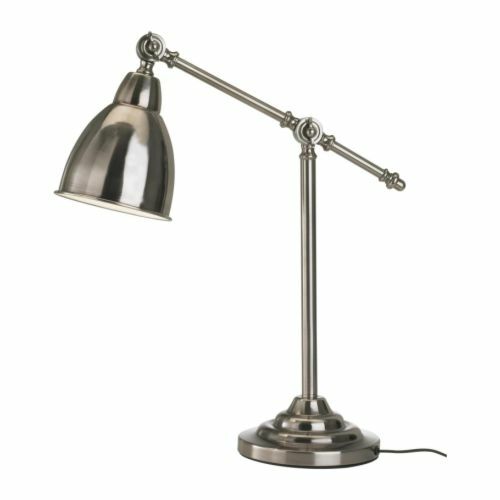 I actually have this lamp in the floor lamp size but I think the table lamp size is adorable. Available here for $29.99. My West Elm shower curtain is still my favorite but this simple black and white shower curtain is lovely too. Available here for $14.99. I am always on the lookout for a good light fixture because there are still several in my house that I would like to replace. I love the bold yet simple look of this light fixture. Available here for $69.99. This mod pendant is so delicious, I want to lick it. It is a massive and bold piece that would be a great statement piece in any home. Available here for $49.99. I’ve been thinking about replacing the credenza in my dining room for a while now. 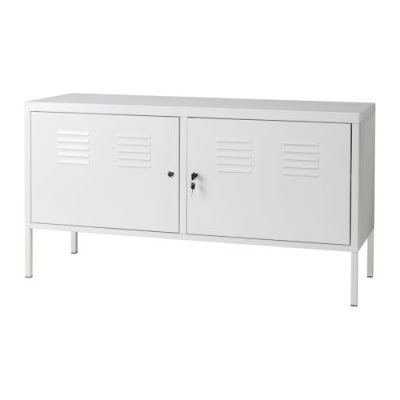 Maybe this simple yet unique locker cabinet would be a nice upgrade? Available here for $99.00. I’m not normally big on patterned curtains since they can look dated fast but these curtains may just be cool enough to change my mind. The pair is available here for $24.99. This light fixture is probably a little bold for most people but I think it is so cheery! It would look awesome in a bathroom or a closet. Available here for $14.99. I’ll be back Thursday for Part 2! You know I bought a house which is an awesome thing to be able to do, but there are things I didn’t know when I bought a house. Okay, let me rephrase that, there are things I didn’t think about before I bought a house. How I would care for my yard was one of those things. I bought my house in January so yard work was very far from my mind when I signed all my paperwork, but spring came soon enough and I found myself with an overgrown yard and no tools to care for it. I started to research lawnmowers and checking craigslist for used ones, but nothing was catching my eye so I decided to buy a new one. After much internal debating I decided to buy an electric mower as opposed to a gas powered one. I make a lot of bad environmental choices (I drive an SUV), but I try to do my part in other ways like recycling so I figured buying an electric mower would be an easy way for me to be conscientious. It is a Task Force 12-amp electric push mower (available for purchase here). It was $169 which was by far the most boring $169 I have ever spent. Despite how annoying it was to pay that much for something, I seriously love this mower. I don’t particularly love mowing the grass but it’s not that bad really, it just takes a lot of time. The reason I love this mower is because it is lightweight and easy for me to maneuver The limit to using an electric mower is that you are literally tied down with a cord so this only works for smaller lawns. My lawn is about 4,000 square feet which is just about the perfect size to use an electric mower. I honestly don’t remember how long the cord I got is, but I think it’s like 100 ft or something. 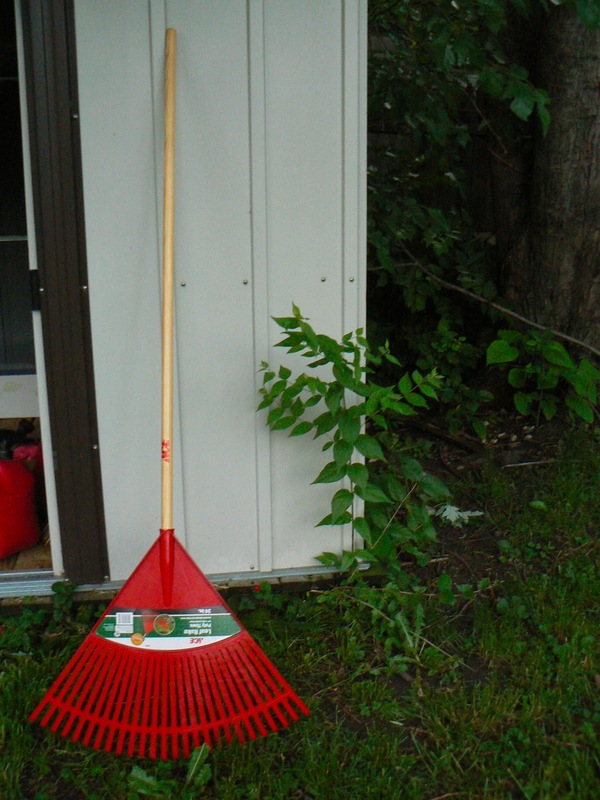 Once I got a lawnmower I felt empowered about what yard work I could accomplish so I got more yard tools! 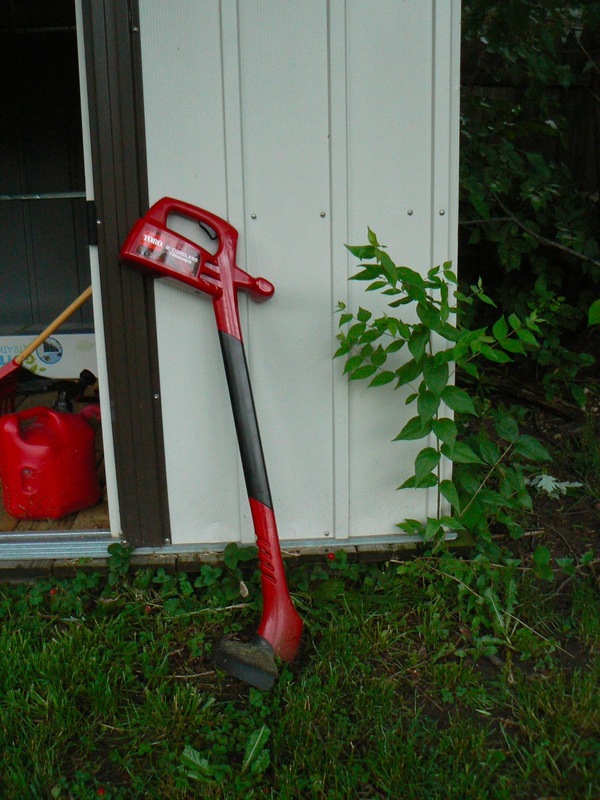 It is a Toro 8″ cordless trimmer (not sure what the 8″ refers to… the length of the plastic string maybe?). It was $49.99 (available here) and it was the most boring $49.99 I’ve ever spent. But even though it was boring money to spend I do like this trimmer. It has a chargeable battery, so it’s cordless which is very convenient. It may not be powerful enough for a guy but for me it is the perfect size and amount of power. After I bought these two large and expensive tools I was tapped out but then after a few weeks I decided I needed a few more things. 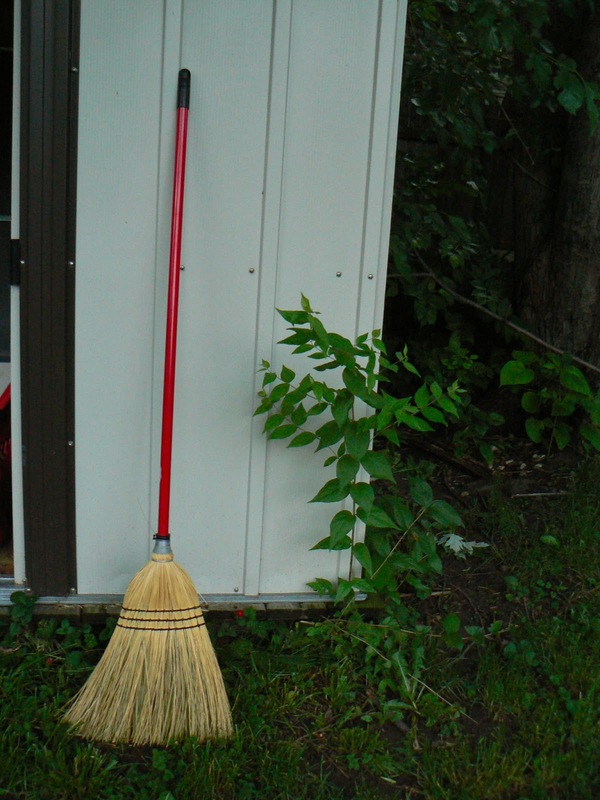 It is probably overkill but I actually find it satisfying to sweep my porch and sidewalks after I mow. I feel old-timey. I do not rake up my grass clippings because that is insane. But I do use my rake a few times a year after I trim the front bushes. I wrote about it here. While it is helpful to an extent, this little trimmer was definitely not worth $49.99. I am still debating about whether or not I should return this tool, but for now I still have it. So those are all of the yard tools I had to buy. It was nearly $300 worth of merchandise that I totally didn’t even budget for. Yikes! That is my big piece of advice for the day: If you are new to homeownership don’t forget to budget for yard tools! Do you feel the same way I do about buying yard tools? a) A glass or plastic open container. I got mine at HomeGoods for $15. b) Rocks (I wish I could have just gotten these from my yard but it’s amazing how few rocks are in my yard). c) Activated charcoal… this one is a little hard to find but they should have it at any nursery. e) Succulents. It may help to have your container with you so that you can see how your plants will all fit inside. My particular container is about 15″ in diameter and I fit three succulents in it. 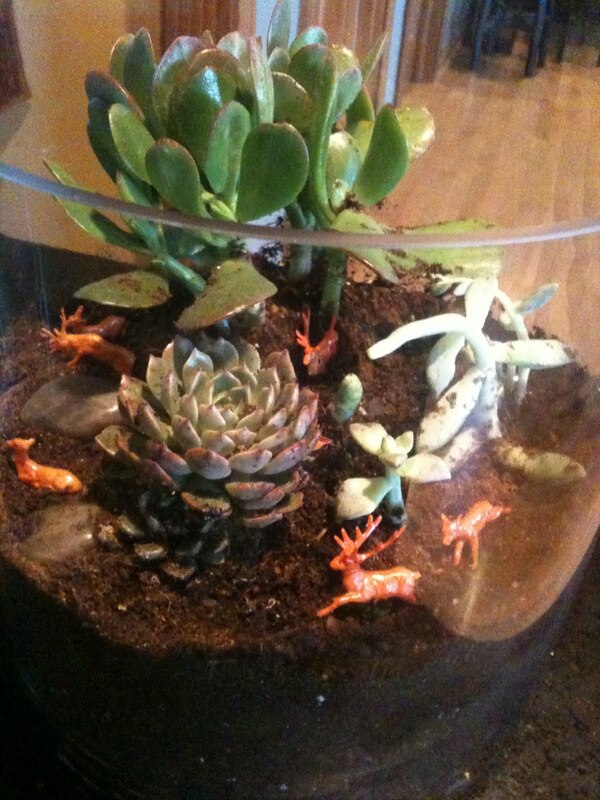 d) Miniature animals because it’s a terrarium and it should be awesome. 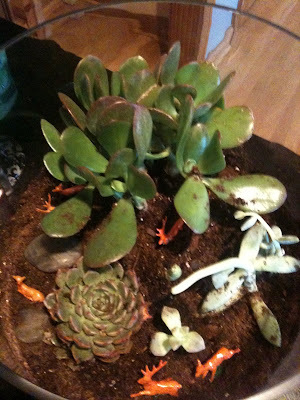 2) Put a layer of rocks on the bottom of your container (I saved a few to put on the top layer). This is for drainage. 3) And then a layer of activated charcoal (about an inch of the charcoal). This charcoal, as far as I understand it, is for smell. I guess these terrariums can get moldy so this charcoal is supposed to keep the mold and moldy smell away. 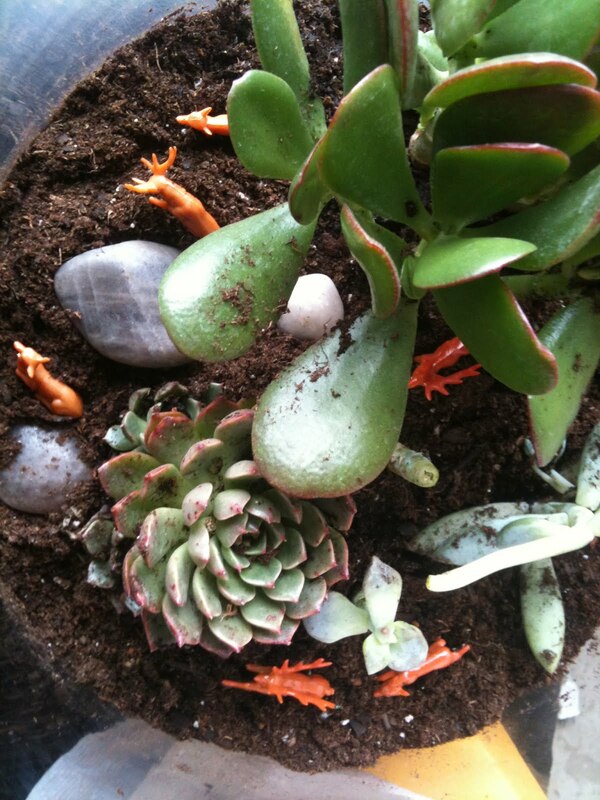 6) Add a little more life to it. I added rocks and teeny tiny baby deer that I bought on Etsy. 7) Take care. 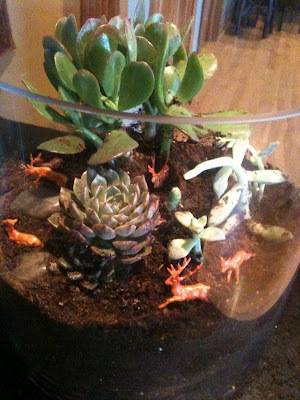 Terrariums are very low maintenance but that only applies if you set them up right to begin with. 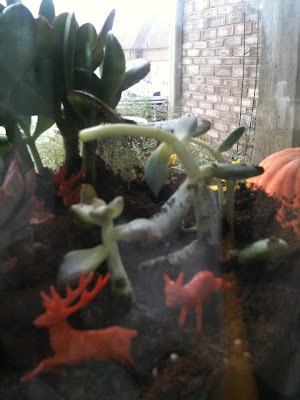 Also, I can’t stress enough how much terrariums need sunlight. If you forget to open your blinds even a few days in a row these little babies will start to die. On the other hand they can go weeks without water. I sprinkle, emphasis on sprinkle, them with water every 10-14 days. 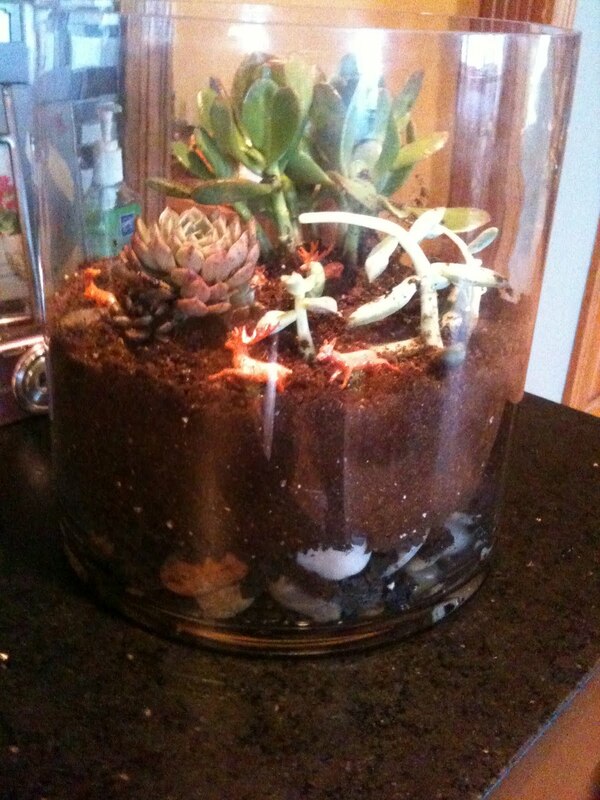 = $49 … yes, that is expensive but have you ever tried to buy a pre-made terrarium? They are over $100! Like this one and these. – Use dirt and rocks from your yard… why not?? – Use a container you have on hand. The only real criteria involved is that they are usually clear (but don’t have to be) and they should have an open top (closed top terrariums require different care). I have a couple of shallow vases right now that would work. – Share actived charcoal with a friend. 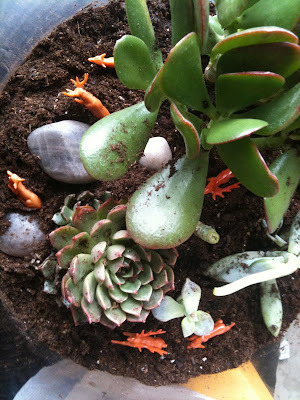 I only used a small amount so there is no need to buy a whole bag… go in with a friend and have a terrarium making party! – Buy plants on clearance. They may look a little sad but nothing a little repotting and love can’t fix. – Use little miniatures you have lying around or make your own. The goal being to create a happy and safe place for 3 years olds to play. I’m not saying this is my best work, but considering my very lowly budget and the constraints (no painting, etc) I’m happy with what I’ve accomplished so far. The good news is that the kids enjoyed playing and had no complaints about the room. 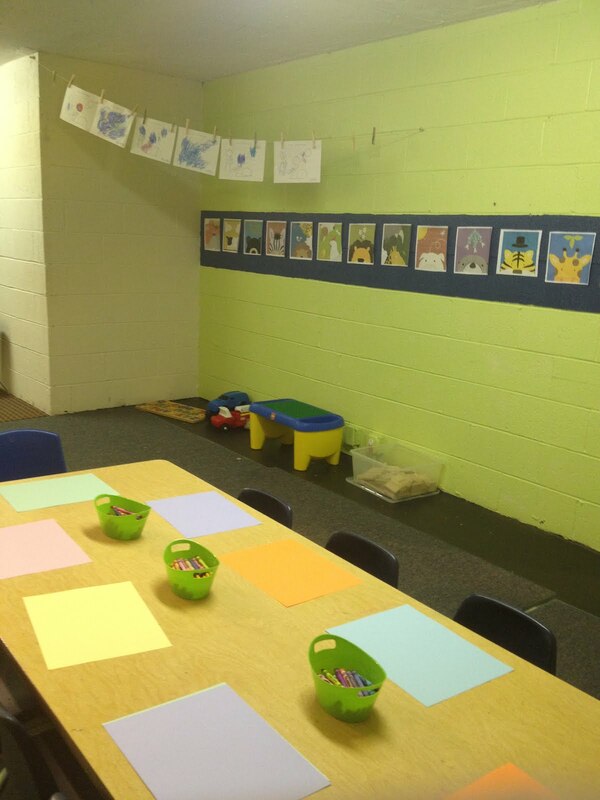 They also really liked having their artwork hung up on the twine with clothespins. I’m sure the room will evolve over the course of the year but I’m glad I spent some time making it look a little better. – 5 packets of tissue paper and ribbon to make these pom pom flowers. – A packet of colorful printer paper (not construction paper) to make these zig-zag streamers and for other uses (the memory verse on the wall and for extra coloring paper). – 3 small and 2 large bright green buckets for crayons and playdough. I’ll keep you all updated and thanks for the input!